Pietersen's 355 against Leicestershire was two runs short of a Surrey club record. Kevin Pietersen had the "rug swept from under his feet" when he was told he would not be selected for England, says former team-mate Simon Jones. The batsman, given hope of a recall by incoming England and Wales Cricket Board chairman Colin Graves, has been told by new director of cricket Andrew Strauss he will not be picked. Jones - who played alongside Pietersen, 34, for England and Hampshire - wanted to see him back in the national side. "Kevin's been misled," said Jones. "He's desperate to play for England. The rug's been firmly swept away from under his feet and it must be so demoralising." Pietersen was told his international career was over in February 2014, only for Graves to suggest he could add to his 104 England caps if he joined a county and scored enough runs to merit a recall. 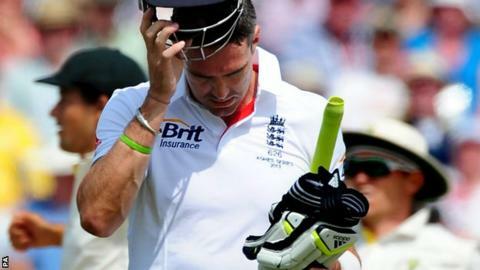 But Ashes-winning captain Strauss said Pietersen will not be selected this summer because of a "massive trust issue". "It's farcical in a sense," said Jones. "He got told to go away and play some four-day cricket and pulled out of a lucrative deal in the Indian Premier League, which is a lot of money." Pietersen says he is "angry and hurt" at being told he will not be considered for selection by England despite making 355 not out for Surrey against Leicestershire. England coach Peter Moores has also been sacked since Strauss' appointment. "Andrew Strauss was asked to come in and take on a big role and make some big decisions, which he's done," former Glamorgan fast bowler Jones, 36, told BBC Radio Wales Sport. "I think the only positive the England lads can take from this is the 'what if' is Kevin coming back has finally been resolved. "It's been lingering for a long, long time. Those England lads can rest easy and concentrate on their jobs."